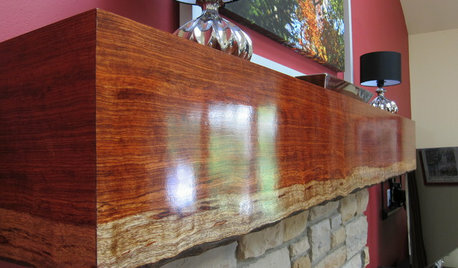 Help with my fireplace mantel!! We bought a house and basically renovating the whole thing. 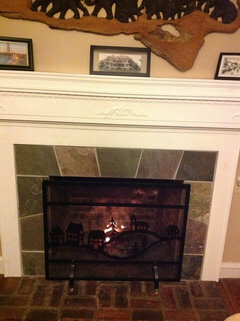 But, we cannot figure out what to do with our fireplace. We don't want to paint in or disturb the brick. I've checked online regarding a brick pocket mantel but not much info on it. Any ideas/ suggestions will be greatly appreciated. We will be painting the wall Smoke by Benjamin Moore. I like your choice of paint color; smoke is appropriate. Hopefully someone will chime in with a solution. In the meantime my suggestion would be to surf the photos on houzz for painted brick FP's with an open mind just to be considering all of your options, as you don't have a lot of wall space between the windows to be boxing it in. Except I think I wouldn't be able to paint over the doggie! Smoke is a beautiful colour. 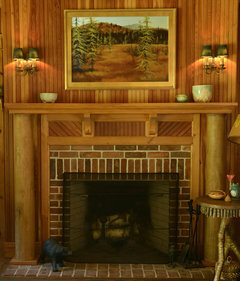 Your choice really whether you put a thick white or thick natural wood mantel, either would work. You can have them made so that it slips over the tops of top brick layer. Your personal style should dictate which one you decide. As for the brick, I would buy some brick cleaner, yes there is such a thing, and wash it. Hi I would give it a good cleaning, paint the inside black if you are not going to use it then put a nice candle arrangement in there, also I would build a nice size wooden mantle on the top either wood stained or white would look nice with smoked colour wall. 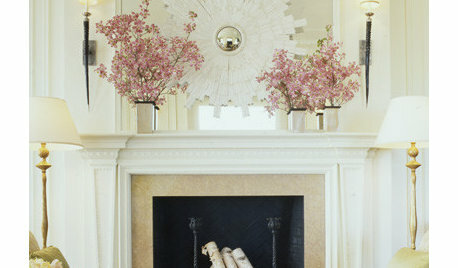 Dress it up with pics etc mirror over mantle will look great. Hope this helps some. I agree with all of the above suggestions. I'd definitely clean the brick and the hearth first. 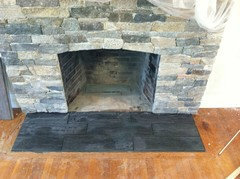 If you can't get the hearth to look better, you can lay a thin layer of stone or brick over it. Then I'd build a mantle over the brick as the others have suggested. I also have to suggest that before you spend any money, make sure brick goes with your decor. If it really doesn't you can have it refaced in stone. 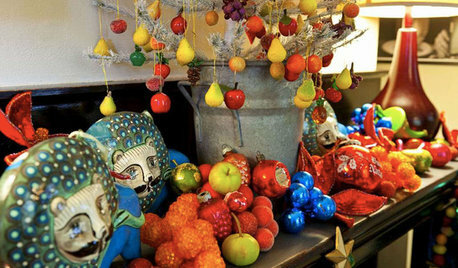 Then add the mantle. 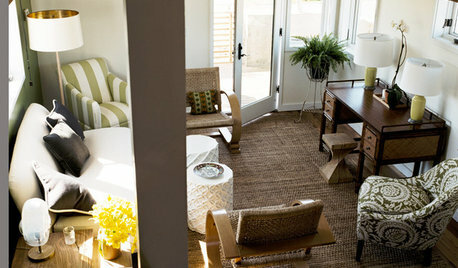 ...Houzz. Seems like a good alternative to painting. 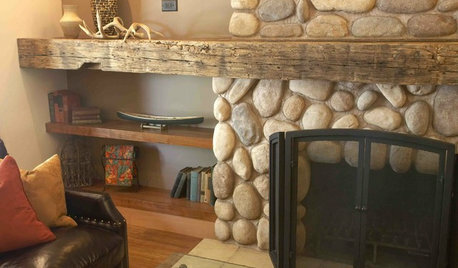 We had a fireplace like this in our house and my husband built a white modern mantel around the edges and we bought different variations of slate and put both around the fireplace, over the brick. Looks beautiful and was very inexpensive. You can also paint the brick white for a cool look. I hear that you do not wish to tear out the brick, let's work with that. Clean the brick. I recommend a muriatic acid solution of 1 part acid to 4 parts water. Mask and tape off all walls and floors with heavy duty plastic sheeting and the red, water resistant duct tape. neutralize the acid with a solution of 1 box baking soda to 1 gallon of water...dry it out and pull the plastic. Paint your walls and send us an update. I think that once the brick is cleaned and the walls painted with color that is determined from the CLEAN brick, options will open up. I'm not a big fan of the grey paint I see getting posted constantly. Complimentary colors or contrasting colors work...grey is too much towards the middle of the wheel. 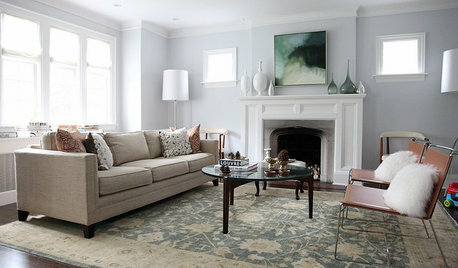 Benjamin Moore Smoke is a blue grey. The complimentary color to the brick is red or orange or purple, the contrasting color is green. That said...surprise me! Thank you all so much for the wonderful suggestions! As most of you have prob experienced, renovating can be a little overwhelming.... Once we decide what to do we will post pics! :) Tyty!! Seriously, no one else sees the dog? 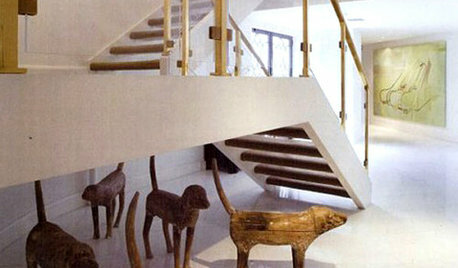 Barnhartgallery, I totally see the dog lol. I see the dog! 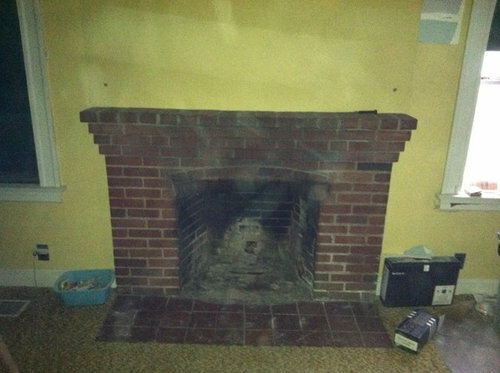 When I first saw this post in small size I thought there was a dog sitting in the fireplace. I don't see the dog.. But I do see something that looks like a scary face. Lol. I see the dog too, with his tail sticking up! The great thing... There is always a solution. Often times there are several viable ones. Not trying to sway you into doing so but I think you should keep the paint option available for discussion. It does seem a little backwards in thinking but I have seen some really great painted brick before. 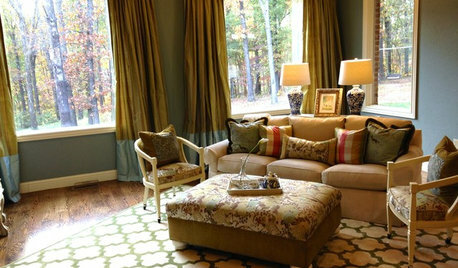 I think I would need further information on the style of home you're trying to acheive to give any further advice. At BarnHartGallery ~ Yes I see it! The dog is either a sheep dog,or Labradoodle. Whichever, it's cute! I think it is a ghost....dog, See the misty quality of the shot? ECTOPLASM! Okay, so you all see it too. Thought it was just me not having enough coffee yet or something. You can use volcanic stone, can be made glazed and painted or natural color that is dark grey. HI --- It actually looks like my X sister in law -- allways screaming - and haunting before her time . HI -- OK - now I will give my comment . A skilled carpenter could build a box encasing the top bricks and then some sides to make a nice surround but leaving enough of the brick showing . There are also companys that make custom cast concrete surrounds which would be safer than a wood surround . There are also codes as to what you can or cannot do. You will need to do some research for your area. Love your color choice ! I see the beautiful yellow lab siting inside!... One thing you might want to do first, is to have the fireplace and the chimney flue cleaned and inspected by a professional chimney company.. we find that many homes are renovated before that important step is taken. 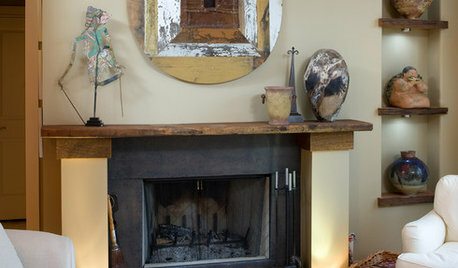 If the fireplace in need of repairs it will be less of a stress worrying about your newly painted walls. About the firebox and the dog, it will look better if the firebox is painted black with a high temperature paint to have a uniform look . For the front of the fireplace it would look fabulous taking the top four courses of core belle brick and installing a traditional wood mantle painted white after the rest of the brick is cleaned. and or with a granite surround. Thought I'd try to upload that photo one more time. Also Suburban Chimney is right, better have that fplce serviced first! This fireplace is beautiful. The wood work really complements the brick. I would like to see more of the painting above the mantel. I see the dog, he looks like a big Irish Setter his head is pointed toward the right and he's sitting. Am I right? I don't know what that is at his haunches. Its a round something or other...blow fish? Fat face with big mouth? 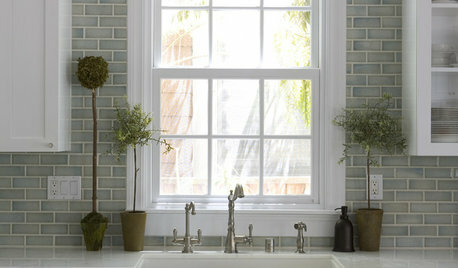 You could cover the brick with stone for a natural look using a stone color that suits your taste. Clean it like Ironside suggests. Even if you paint it, it will need to be cleaned first so you won't have lost anything. I see the dog big time ! Update to our fireplace! 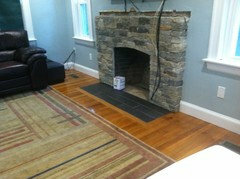 We went with a Boston Blend Ledgestone with a porcelain plank hearth in charcoal. So happy with our choice. The wall color is Smoke by Benjamin Moore. What wood to use for vanity in powder room?